Cursing the fig tree is one of the miracles of Jesus in the Gospels. It is included in the gospels of Mark and Matthew, but not in Luke or John. 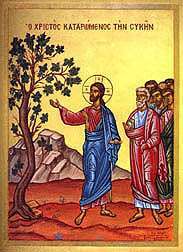 In the Markan text it comes in two parts: in the first, just after the Triumphal entry into Jerusalem and before the Cleansing of the Temple, Jesus curses a fig tree for being barren; in the second part, presumably the next day, the tree has withered, prompting Jesus to speak of the efficacy of prayer. Matthew presents it as a single event. In the morning, as they went along, they saw the fig tree withered from the roots. Peter remembered and said to Jesus, "Rabbi, look! The fig tree you cursed has withered!" "Have faith in God," Jesus answered. "Truly I tell you, if anyone says to this mountain, 'Go, throw yourself into the sea,' and does not doubt in their heart but believes that what they say will happen, it will be done for them. Therefore I tell you, whatever you ask for in prayer, believe that you have received it, and it will be yours. And when you stand praying, if you hold anything against anyone, forgive them, so that your Father in heaven may forgive you your sins." Early in the morning, as Jesus was on his way back to the city, he was hungry. Seeing a fig tree by the road, he went up to it but found nothing on it except leaves. Then he said to it, "May you never bear fruit again!" Immediately the tree withered. When the disciples saw this, they were amazed. "How did the fig tree wither so quickly?" they asked. Jesus replied, "Truly I tell you, if you have faith and do not doubt, not only can you do what was done to the fig tree, but also you can say to this mountain, ‘Go, throw yourself into the sea,’ and it will be done. If you believe, you will receive whatever you ask for in prayer." Most scholars believe that Mark was the first gospel, and was used as a source for Matthew. The differences between the incident as described in Mark, and the version given in Matthew, are explicable from the view-point of Markan priority, i.e. that Matthew revised the story found in Mark. Traditional Christian exegesis regarding these accounts include affirmation of the Divinity of Jesus by demonstrating his authority over nature. 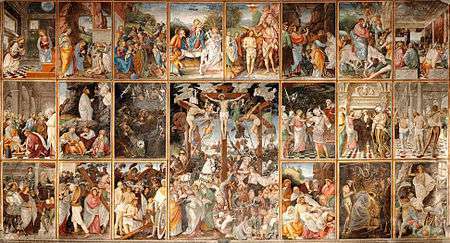 Traditional Reformed thinking states that this event was a sign given by Jesus of the end of the exclusive covenant between God and the Jews – see also Supersessionism. According to this interpretation, the tree is a metaphor for the Jewish nation i.e. it had the outward appearance of godly grandeur (the leaves), but it was not producing anything for God's glory (the lack of fruit). This interpretation is connected to the parable of the barren fig tree. F. F. Bruce states that fig trees produce "taqsh" before the season if they are going to bear fruit in the season itself. Since this one didn't, it was a sign that it would not produce any fruit that year either. Theology professor Craig Keener has used these passages as a reason for an early dating for the Gospel of Matthew, saying only someone with a close knowledge of the Mount of Olives would have known that its fig trees come out in leaves around the Passover time of year. In the Gospel of Luke, a similar story is told as one of Jesus’ parables known as the Parable of the barren fig tree. It has very similar wording to Mark and Matthew. A very different story appears in Infancy Gospel of Thomas, but has a similar quotation from Jesus: "…behold, now also thou shalt be withered like a tree, and shalt not bear leaves, neither root, nor fruit." (III:2). Wikimedia Commons has media related to Cursing the fig tree. ↑ Kinman, Brent (1995). Jesus' entry into Jerusalem: in the context of Lukan theology and the politics of his day. Brill. p. 123. ISBN 978-90-04-10330-6. ↑ "Biblegateway Mark 11:12–25". Biblegateway.com. Retrieved 2012-01-05. ↑ "Biblegateway Matthew 21:18–22". Biblegateway.com. Retrieved 2012-01-05. ↑ Richard Whately, Lectures on Some of the Scripture Parables, John W. Parker and Son, 1859, p. 153. ↑ Keener, Craig, 1999, "A Commentary on the Gospel of Matthew", ISBN 0-8028-3821-9, p 504. Davies, William David, & Allison, Dale C., "Matthew 19–28" (T&T Clarke, 1997) pp. 147ff. Lane, William L., "The Gospel of Mark" (Eerdmans, 1974) pp. 398ff.